onto a SSD for best performance. Before you install Windows 7 onto your new SSD make sure you set the the SSD to run in AHCI mode to ensure max Performance. if you have any other Hard Drives plugged in I would make sure that your SSD is plugged into the SATA0 port on the motherboard, this is to ensure it is the first drive the installer see and your first drive (just to make life easier). Install Windows 7 as normal; 1) boot of a CD/DVD or 2) from USB (i will write guide later on this). On my system in only took me 13min to install Windows 7 x64 and to log for the first time, so it was ultra fast install process. Here are the main settings and tweaks you should change after installing Windows 7 to ensure max SSD Performance. TRIM Support – How to verify its enabled? Windows 7 should enable TRIM by default when installing best performance. DisableDeleteNotify=0 if TRIM support is ready and active. and change the value from 3 to 0, and reboot, then you can delete all files in “C:\windows\prefetch\” to free up space on your SSD. Reason: This will free up space on your SSD. Reason: This will free up your RAM. 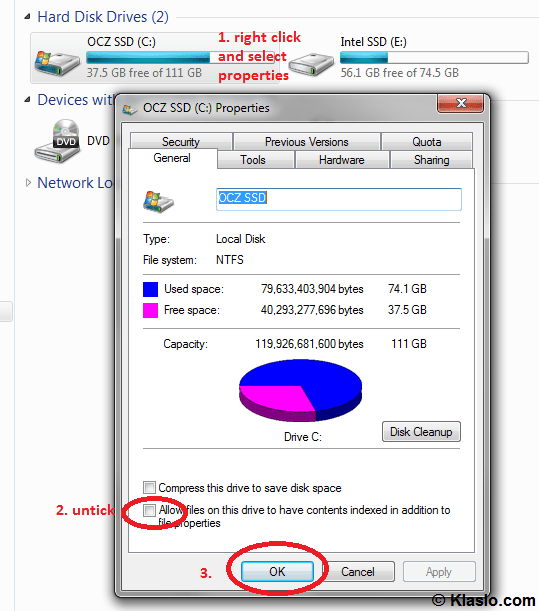 Reason: SSD don’t have any Cache memory like normal HDD’s, so there is no point in enabling this. System Page file – Disable or enable? I would recommend leaving this on, becauseif you disable System Page file and you run out of RAM your System WILL crash, but if you are running low on space on your SSD then change the Page file size to 512MB or 1GB. However, if you have 8GB or more RAM then by all means disable Page file. This will free up space on your SSD. General rule Page File is 1.5times the size of your RAM, but remember if you start seeing Blue Screen of Death errors (BSOD) then re-enable page file.